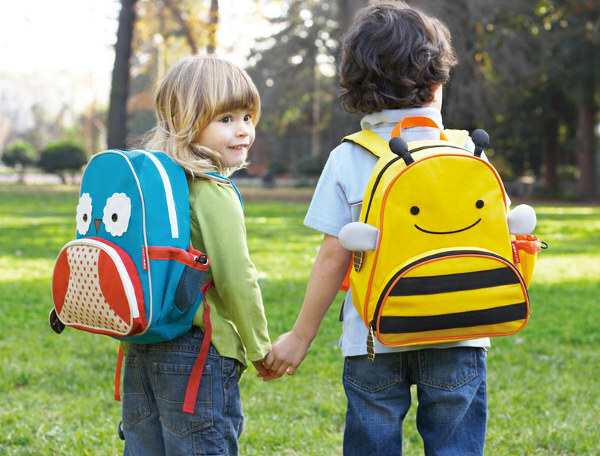 School, preschool or daycare all have one thing in common – you need your own bag. Of course, there are bags everywhere for children, but gorgeous bags? They take a bit more ferreting out. Not to worry – we’ve done all the hard work for you, and here are the bags we think are the top of their class. Since there are so many backpacks around which are really toddler sized, we are starting off with something just a bit bigger – the new designs in the Penny Scallan range of School Backpacks (pictured above). 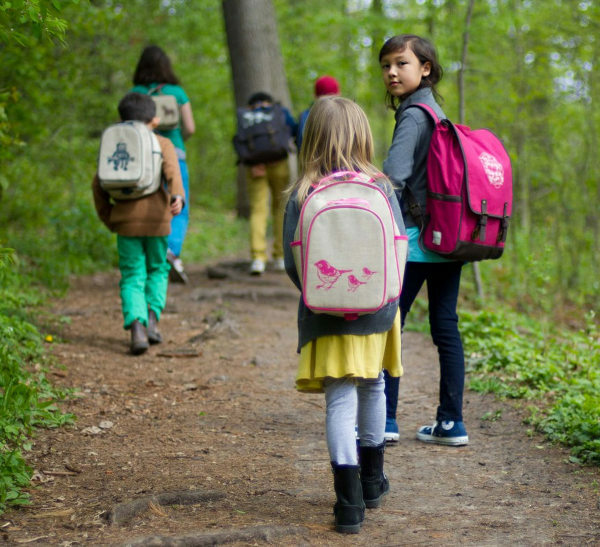 There are five designs in the range, and the backpacks are a generously sized thirty-nine centimetres in height, so they’ll take kids right through primary school. Made from PVC-coated cotton canvas, this is one backpack that’s hard to beat. Check out all five designs and buy directly from Penny Scallan for $59.95. The value packed So Young Mother Toddler Backpack from Mini Hippo comes in four hipster-friendly designs, and includes a detachable matching lunchbox with its own handle. Used together or separately, these backpacks have a wipeable exterior and an easy-clean nylon interior. The So Young Mother Toddler Backpack is $69.95 from Mini Hippo. 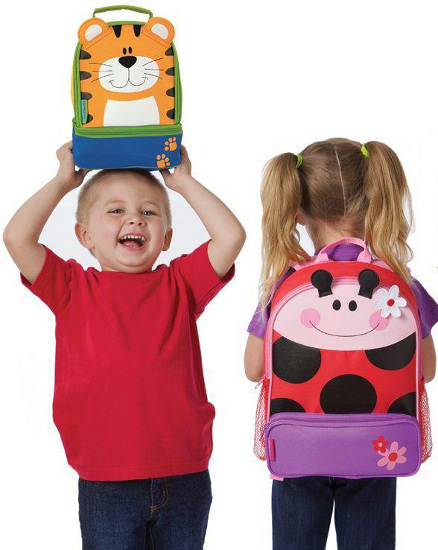 Another great find for toddlers are these Woddlers Toddler Backpacks – there are ten animal designs in the collection, and a good mix for both boys and girls. With embroidered laminated canvas on the front, these nylon packs are $35.95 from Woddlers. Continuing with our animal theme, the Sidekick backpack from Stephen Joseph is slightly larger than the average toddler backpack, and could be a good middle ground for older kids. Two zippered compartments allow plenty of room for toting things around, and the range also includes matching lunch pouches and mini icepacks. Get yours from Lime Tree Kids for $39. It seems not a year goes by when we don’t mention the always adorable backpacks from Skip Hop. But how could we not? They are a great size for small kids, and they come in so many lovely styles that your child is sure to find one that’s just right for their personality. Bright Star Kids has all the newest styles in the Skip Hop range for just $34.95 each. What? That’s not a backpack, I hear you say… but what backpack doesn’t benefit from some backpack bling? The Kimochis Nesting Heart might just be the perfect way to reassure nervous first timers heading off to school, preschool or daycare. 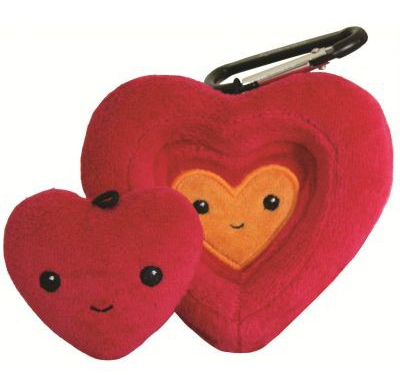 Use the carabiner to clip the larger heart to your child’s backpack and pop out the smaller heart to keep with you during the day while you’re separated. It’s $24.95 from Little Sprout. A pile of schoolbags really can be an overwhelming sight, so why not help your child pick out theirs from the crowd by personalising it? Tinyme have lots of shapes and sizes of bags available in blue, pink or red. Each of them can be personalised with your child’s name and a motif of their choice from Tinyme’s enormous range. Prices vary depending on your choice of bag. Check out the extensive range of bags and motifs at Tinyme. 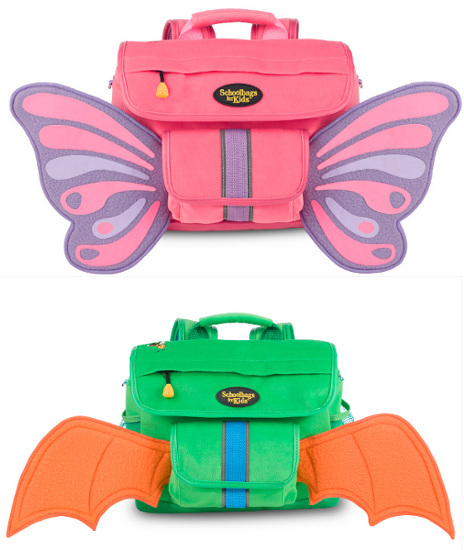 Yep, that’s right, it’s a backpack with wings. 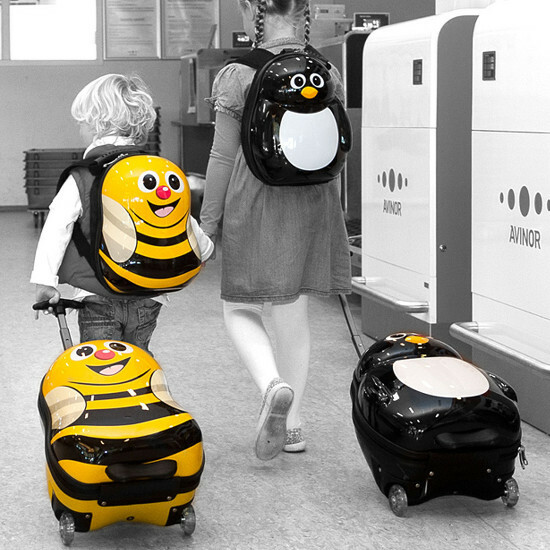 These Fuzzy Flyers backpacks tick all the boxes where my wing-crazy children are concerned, and I’m amazed we haven’t seen more of this idea before. There are three designs – butterfly, dragon and ladybug – and they have plenty of pockets as well as a cosy edge – they’re made from velour and fleece! 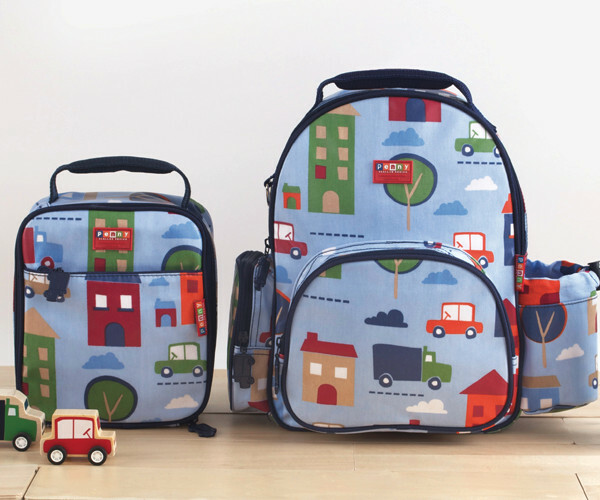 Schoolbags for Kids has all three designs for US$49, and they will ship to Australia. In our guide last year we mentioned the amazing backpacks from Mad Pax, and this year we have to mention them again because they have brought out the ultra-cool Bubble pack. It comes in three sizes, the smallest of which, the Nibbler, is almost too cool for school. They don’t ship internationally, so this is one for your freight forwarder or your friend who lives in the States. See all six colours at Mad Pax. The Bubble Nibbler is US$32. 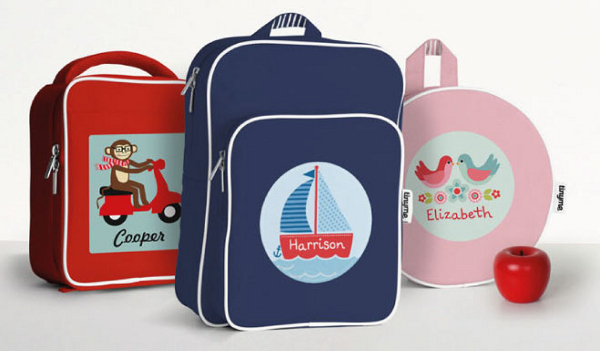 UK-based Cuties & Pals certainly got the name right on their kids’ luggage and backpack sets – they are seriously cute. The thirty-two centimetre backpacks (which all have matching trolley case luggage) at one kilogram are a bit heavier than standard backpacks, due to their hard shell exteriors. But it is just this component which makes them so durable. There are ten gorgeous designs, which you can see at Cuties & Pals, and the backpacks can be bought locally at Coco & Harper either singly, or as a luggage set. Prices begin at $39.95 for the backpack.